To reach this unique fishing lodge known as the Rifflin'Hitch Lodge in Southern Labrador in Newfoundland Labrador, Canada one must fly in by helicopter. After lift off and a magnificent holiday, guests get a beautiful aerial view of the Eagle River and the surrounding region of Southern Labrador. Helicopter - Bell 427 taking off from Rifflin'Hitch Lodge on the banks of the Eagle River in Southern Labrador, Labrador, Canada. Helicopter at Rifflin'Hitch Lodge, Eagle River, Southern Labrador, Labrador, Newfoundland Labrador, Canada. 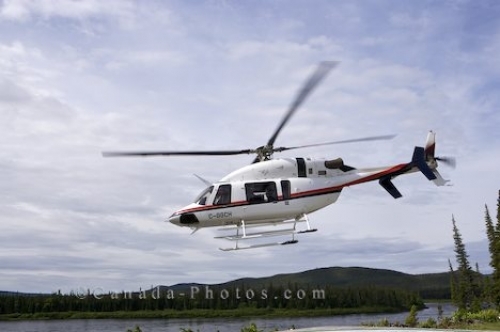 Picture of a helicopter lift off from the Rifflin'Hitch Lodge along the banks of the Eagle River in Southern Labrador.